My in-laws have everything they need. If they want a new vehicle, they go out and get one. If they want to take a trip, they book it. They have rather simple tastes in life, which has helped them live well within their means. Their simple tastes also mean they have leftover money to afford the things that call to them, often without having to save up for the purchase. While they don’t have much, they have all they want. That makes giving them gifts pretty challenging. They are gracious and will act pleased with whatever we give them, but we love to give gifts that matter to people. That’s how our family stumbled upon charitable giving as a present. My in-laws have a number of causes that they support, and with the money we’ve set aside for gift-giving occasions, we provide a donation to one of those causes. In some cases, the cause provides a card to present. In others, we handle that ourselves. We have loved doing these types of gifts for many reasons: it’s quicker than shopping, it can cost as much or as little as our budget affords, and it’s a gift that’s meaningful to the recipient. However, we don’t limit our charitable contributions to gift-giving occasions. We also have causes that are near and dear to our hearts, so we contribute to those organizations as well. Whether you donate to charity as a gift or because it’s a cause that’s important to you, you are benefiting – and not only with a warm and fuzzy feeling. Though it might not be your main intention, there are financial benefits of charitable giving, too. Not all charitable giving has to be done as a gift that you present a loved one. However, if you decide to go the route of a charitable gift, your wallet will probably fare better than if you went shopping. It’s can be easy to let your gift-giving budget get out of control. You probably set your budget up earlier in the year, taking a rough guess at how much you’d want to to spend on your holiday shopping. As the season draws near, you find yourself anxious to get the right gift for everyone on your list, but those perfect gifts may not jive with the budget you set up months ago. You are left deciding whether to get a less-than-“perfect” gift or to go over budget. If you are donating to charity for the majority of your gifts, this is a non-issue. You simply take your gift budget, divide it by the number of people in your list, and now you know how much to donate for each person. You don’t have to feel guilty for the amount you spent; you had set a budget and now you are sticking to it. My husband and I have been battling significant student loan debt for over 10 years. Despite that, early in our marriage, we committed to a giving 10% of our pre-tax income to our church. For the uninitiated, this is a fairly common practice within the Christian community. Prior to contributing 10% of our pre-tax income, we were donating $10-20 a week, so this was a huge change for us. You think we’d be wallowing in our sad, little apartment over the huge hit that our finances just took. However, we found that we didn’t really notice that we were “missing” hundreds of dollars each month. At the time, we didn’t have a budget, so it had been pretty easy for us to spend mindlessly until we made this decision. Even now, I couldn’t tell you where all our money had been going. We certainly weren’t living the high life! But the moment we made a commitment to donate a significant portion of our take home pay, we never really noticed that the money was gone. Our decision to donate did force us to sit down and create our first budget. I remember that our grocery bill had been all over the place and I found it a challenge to rein in our food costs. We were more careful about how often we ate out. Other than that, life preceded much like it had before – just with a heightened awareness of our finances. There have been times in the ten years since our decision that I’ve thought of all the ways I could use our donation. We could quadruple our debt snowball. We could take a nice vacation. We could buy a new car. We could replace our sofa. Ten years ago, that’s not what would have happened. The necessary money would have been siphoned out of our accounts by mindless spending, leaving us unable to buy the sofa or the car. Now, we would probably be more responsible with the money, though it’s a moot point; we aren’t reversing our commitment to our donation. Our commitment to giving forced us to increase our financial discipline, even when it didn’t always feel like it. If you have ever donated to charity, then you are probably well aware that there are tax benefits to doing so. Keep receipts of all your donations, itemize when filing your taxes, and the amount that you have donated to charity will be deducted from your taxable income. Before tossing money at every “charity” that comes along, it’s a good idea to make sure they qualify as a charity in the eyes of the Internal Revenue Service (IRS). If the organization of choice does not qualify as a charity, you can still donate money, but you won’t be able to claim any tax benefits. If your income puts you just inside a tax bracket, your charitable giving could make a significant difference come tax time, reducing not only your taxable income, but possibly reducing the tax rate that you pay. Generally, you are allowed to deduct up to 50% of your adjusted gross income. However, if you are giving a significant portion of your income, it’s a good idea to consult a professional tax advisor, because some cases are limited to 20-30% tax deductions. We’ve already covered how giving to a specific charity might make you more disciplined in your spending. However, if you become more and more involved with that charity, you might find that it’s the first step toward a shift in your life’s perspective. Perhaps the first step is donating money, but if the cause is personally important to you, you might begin to volunteer your time. As you become more and more involved at a personal level, you might begin to see a natural shift in your life. Think of all the stories you’ve read of people who have served in soup kitchens for the homeless. As they see how the homeless have positive outlooks with very little to their name, often the volunteers begin to question their own “extravagant” lifestyle – which has left them with a less-than-positive outlook. Your own involvement may open your eyes to an expensive lifestyle that is draining your wallet, but leaving you unfulfilled. Fancy vacations or huge homes might seem unimportant when compared to the plight of those served by your beloved charity. That doesn’t mean that you’ll sell all you have and donate the rest to your charity. It just means that you have become more aware. Your mindset has changed. You now know what is really important in life – and that might not always be material items or extravagant trips. As a natural outcome from the shift in your perspective, you’ll find extra money in your checking account. You can still use it for your own benefit without being materialistic. You can pay off debt, save for retirement, or tuck away money for your children’s college. Budget your charitable giving – whether it’s tucked inside your gift-giving budget, completely separate, or a combination of the two. Make a plan. Verify that your organization of choice is qualified as a charity with the IRS. If not, encourage the organization to become qualified or find a similar organization that meets the definition. Keep records of all donations. Not all donations will come with a receipt, but cancelled checks or bank statements may suffice. Research organizations to ensure that your gift is well-used and that it does not spend a significant portion of donations on administrative overhead. If you or a loved one has a passion, then donating in support of that passion is done just because it’s the right thing to do – not because you will benefit financially. Few people would recommend giving to random charities just to reap tax benefits or to pass out a few cheap Christmas gifts. However, if you’ve previously passed up the idea of donating to charity because you didn’t think you could afford to, hopefully now you understand that there are financial benefits of charitable giving. 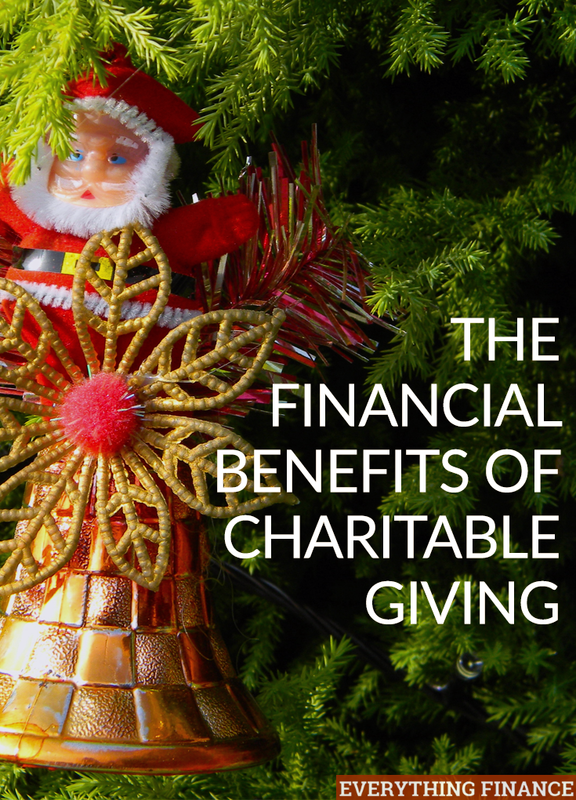 How have your finances benefited from your charitable donations? Do you donate to charity on behalf of others as a way of giving a gift?